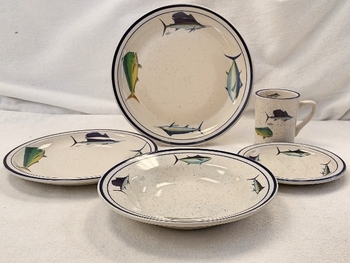 Classic Rustic Blue Speckled Big Game Offshore Fish Series 20pc (4 place settings) Dinnerware Set. Features a dark ocean blue hand painted rim with blue speckles throughout each piece. Original paintings of the Offshore Fish Series (Sailfish, Dolphin, Marlin and Tuna) are by Geoff Hager.